Last October, we read and posted a great post by our friend Paul Anater: Induction Cooktops Take A Big Step Forward . Paul talked about the future of induction cooktops, and now we have taken one step further into that future. Appliance giant Whirlpool has introduced it's very own induction cooktop. We were expecting Whirpool's latest venture into the induction world may come with less of a price tag than their competitors, but sadly, no. The Whirlpool top is still retailing for around $1,349.00 while the Thermador / Bosch's eqivalent 30" (4 element) stands at about $1,430.00. Of their latest cooktop, Whirlpool says "this Resource Saver™ induction cooktop is our most efficient and easiest to clean cooktop ever. It features a 30" eco-friendly Schott Ceran® surface with 4 induction elements, plus Power Boost and Simmer features. Advanced induction technology transfers up to 90% of energy directly to your magnetic cookware, using 25% less energy than traditional ceramic-glass cooktops and 58% less energy than gas cooktops. Plus, the Boost feature allows you to boil water in half the time, and the Glass Touch controls offer a contemporary look and an intuitive design that’s easy to use." The induction technology transfers up to 90 percent of energy directly to magnetic cookware, using 25 percent less energy than traditional ceramic-glass cooktops and 58 percent less energy than gas cooktops. This savings could power a 60W light bulb for 7 hours with the energy saved every time water is boiled. "Because induction cooking is so common in Europe and in professional settings, makers of high-quality cookware--and, in recent years, even of good to average cookware--have taken pains to produce extensive lines of induction-ready cookware. That they do by making sure that one of the layers in the base cladding "sandwich" is a readily magnetized metal of sufficient thickness to readily absorb the available electromagnetic energy and convert it to heat. Regrettably, there is no simple way to know if this or that line, or particular piece, of cookware is really induction-ready, unless you have the opportunity to actually handle it. In that case, all you need is a simple magnet of any kind--say one of those decorative toys meant to be stuck onto refrigerator doors. 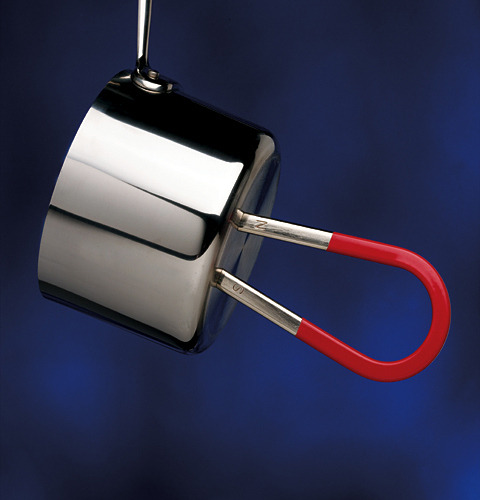 If such a magnet readily clings to the base of the cookware piece, that piece is induction-ready; if the magnet does not cling, or clings only very weakly, the piece is not."